TIGI Bedhead Styleshots Epic Volume Conditioner is the perfect style enhancing product for bouncing and voluminous locks! This gentle moisturiser boosts dull and flat hair from the root for a full-bodied finish that stands out from the crowd. The nourishing formula protects hair from humidity which causes flatness or frizz for a smooth and soft result! 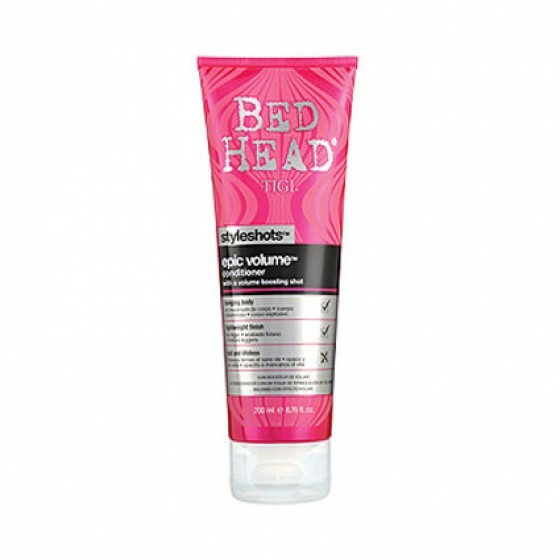 - For best results, apply TIGI Bedhead Styleshots Epic Volume Shampoo to wet hair. - Apply TIGI Bedhead Styleshots Epic Volume Conditioner. - Massage from root to tip. Review "Styleshots Epic Volume Conditioner"